The Australian Government has a new commitment to redirect aid spending from traditional aid programs, such as health and education, towards ‘Aid for Trade’. Aid for Trade initiatives are meant to lower transaction costs, making it cheaper and faster for developing countries to buy and sell products overseas. This also benefits Australia because it makes it cheaper and faster to buy from and sell products to aid recipient countries. 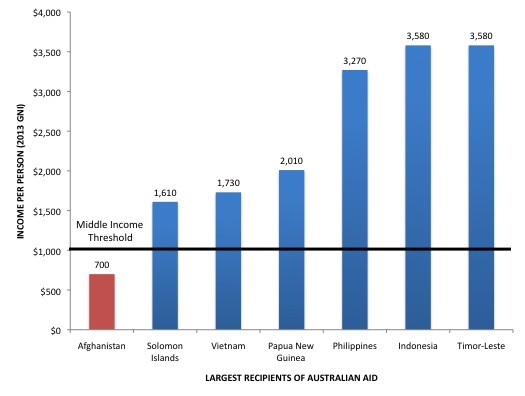 Many of Australia’s aid recipient countries also rely on Australia as a major trading partner. For example, over one third of PNG’s exports and imports are with Australia. While it is expected that Australia will benefit under this new approach, it is unclear whether the benefits to aid recipient countries from Aid for Trade will be similar, better or worse than those from traditional aid programs. According the Australian Government, Aid for Trade is about opening up new markets to help boost trade in developing countries. Examples of Aid for Trade initiatives currently funded by the Australian aid program include: paying for DFAT employees to negotiate a Free Trade Agreement with Pacific nations to remove trade barriers; and infrastructure projects such as roads or bridges to allow easier movement of products in and out of developing countries. Aid for Trade is becoming the flagship of the Australian Aid program under the Government’s new aid paradigm. 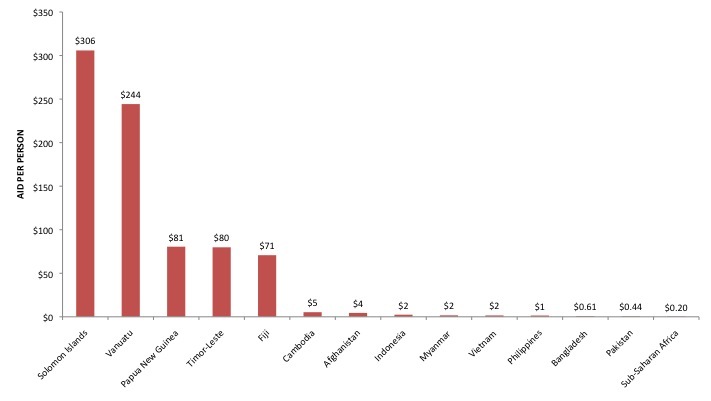 By 2020, one fifth of all aid will be spent on Aid for Trade. 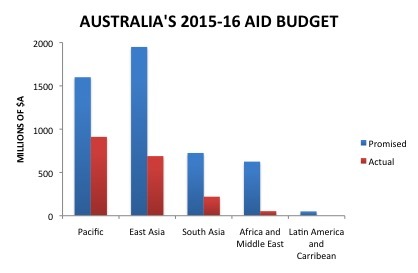 Australia will benefit significantly from an increased focus on Aid for Trade as this will lower transaction costs when trading with Australian aid recipient countries. 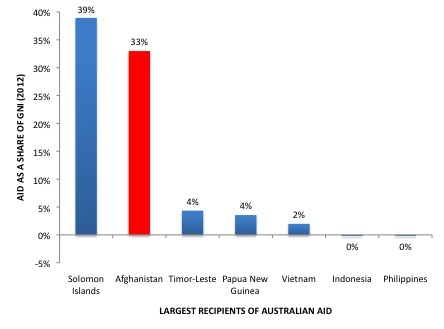 Australia is a major trading partner for Australia’s main aid recipient countries, especially in the Pacific. 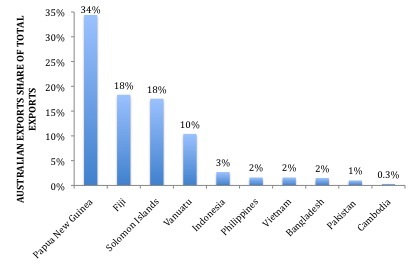 The chart below shows the share of Australian exports of the total exports to these countries. Australia is a top 20 trade partner for all of these countries and a top 5 trade partner for the Pacific countries. 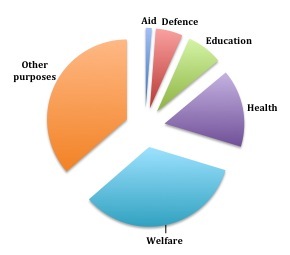 To fund Aid for Trade, aid will be shifted away from traditional aid programs, including health and education. While it is likely Australia will benefit from more efficient trade, it is unclear what the impacts of this shift will be for aid recipient countries. 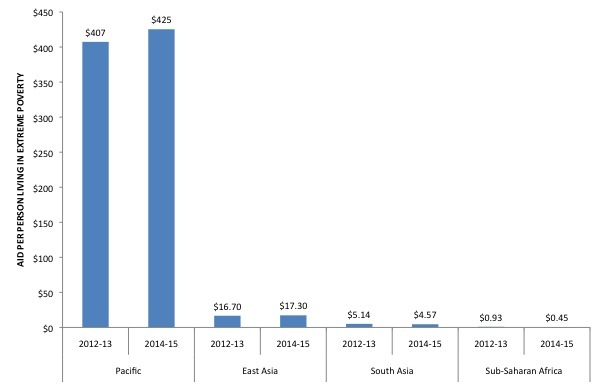 Little analysis has been made available by the Australian Department of Foreign Affairs and Trade that discusses what the implications are, positive or negative, for developing countries when aid funding is shifted away from traditional programs to Aid for Trade initiatives. Given that aid has been redirected away from traditional aid programs towards Aid for Trade, Australia is set to be a beneficiary of this and the benefits for developing countries have yet to be made clear, the question emerges, should Aid for Trade be the flagship of the Australian Aid program?